•You have a layer of points that represent survey sites or structures and you wish to pass a value encoded in the network (e.g. Strahler order) to these points. oIf your points are the nodes extracted by RivEX then use this tool. oIf the values you wish to transfer were generated by RivEX then you can use this tool. 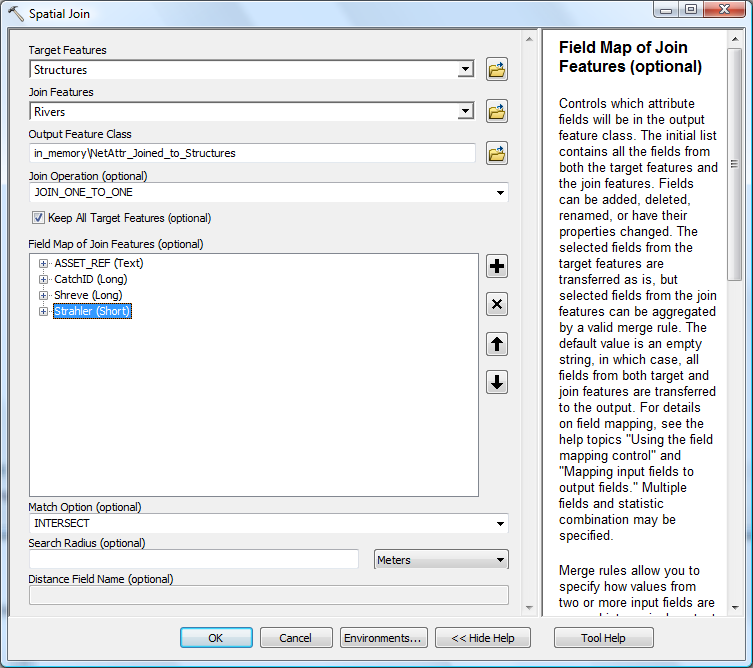 oFor all other values you use the standard spatial join tool. 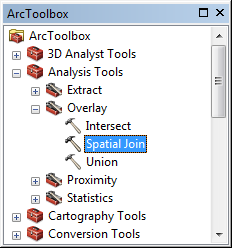 •The Spatial Join tool is found in ArcToolbox > Analysis Tools > Overlay tool set as shown below. •An example of the tool being used is shown below. The RivEX fields (CatchID, Shreve and Strahler) are being joined to the structure point dataset (which has only 1 field called (ASSET_REF) to create a temporary in_memory dataset called NetAttr_Joined_to_Structures. The spatial relationship being used is Intersect which implies that the structure point dataset has already been snapped to the river network. There are other spatial relationships that can be used.